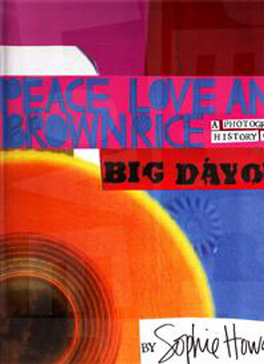 “Peace Love & Brown Rice” is a photographic journey documenting the Big Day Out music festival.The book takes the reader through each year, beautifully guided from day until night using fascinating photos, collected memorabilia and personal notation. The first book ever produced about the event, it is a truly unique publication. Sophie has had amazing access to the event as an official tour photographer and her archive of images is extraordinary. The book showcases not only the colossal nature of the event and the legendary names it attracts, but the backstage and candid moments that make this event one of the most celebrated music festivals in the world. Where else will you find Metallica, The Black Eyed Peas, Jet and Kamahl featured in the one place! The book makes an ideal gift for the Music Lover, Festival Lover, Photography Lover and all those “Hard to Buy” friends and family. Peace Love and Brown Rice was created to be a carbon neutral book. It is printed on 100% recycled paper with soya inks. An excellent collection of photos, thoughts, and memories of the BDO. Sophie&apos;s manages to capture moments in a way that you can still feel the fun, dirt and sweat that goes with it, so much so that you are transported back and all you can do is smile and enjoy over again. A big, chunky book that is fitting for the subject - imagine what was left out! You will never see a better collection from any festival, anywhere. Own it and cherish it.